Bloating is a very uncomfortable and embarrassing condition which almost one in 10 Americans suffer from on a regular basis. The excess gas trapped in the small intestine causes bloating. It makes the stomach visibly swollen. The best way to get relief from bloating is to pass out the excess gas or a bowel movement. Few effective home remedies for bloating are mentioned in detail below for you. So, read through and thank us later! Here are some tried and tested home remedies for gas and bloating. Choose any one remedy and try it as mentioned to get relief. Ginger is a carminative which means it relieves the pressure of bloating by helping gas pass through the digestive system. It contains gingerols and shogaols, act as pain relievers which soothe and relax the intestinal muscles. It restricts the bad bacteria production in the colon. Peel and slice a piece of fresh ginger root. In a cup, mix the slices with lemon juice and honey. Pour some hot water into it. Cover and let steep for 15 minutes. Consume ginger tea 3 times in a day for effective results. Peel and grate a piece of fresh ginger root. Eat 1 teaspoon any time you need for instant relief from bloating. Use it in your cooking daily. Alternatively: You can add 5 – 6 drops of ginger essential oil in 3 – 4 tablespoons of any carrier oil. Massage this mixture on the stomach. Caraway seeds have a carminative property, which helps to prevent the build up of gas by aiding in quick expulsion. The carvol and carvene present in caraway seeds help in soothing the tissues of digestive tract and encourage the expulsion of gas. This provides instant relief from bloating problem. Chew a pinch of caraway seeds several times a day to relieve bloating. If you don’t like the seeds, try caraway seed crackers. Crush 2 teaspoons of caraway seeds and add them to a cup. Add hot water and let steep 10 minutes. Strain and drink the tea before meals for effective results. For added benefit, you can chew the strained caraway seeds while having food. Alternatively, you can also use black caraway seeds for bloating. Fennel seeds are very effective for digestive problems like bloating and therefore, it is one of the best natural remedies for bloating. It contains carminative, diuretic, pain-reducing and anti-microbial properties. Fennel seeds help relieve bloating by relaxing muscle spasms in the digestive tract. Fennel contains volatile oils which prevent gas and act as an anti-spasmodic, helping trapped gas pass easily through the system. Add them to a cup of hot water and let steep 10 minutes. Strain and consume the tea for 2 – 3 times in a day. You can get relief within 5 – 10 minutes. Note: You can also simply chew a teaspoon of fennel seeds. Alternatively, you can massage some fennel seed oil on the abdomen to ease the pain caused by bloating. Note: Pregnant women should consult their physician before trying out the fennel seeds method. Though fennel seeds are considered safe, the tea made by following the above process can cause pre-term labour if consumed during pregnancy. The methanol oil present in peppermint has antispasmodic effect on the muscles of digestive tract which aids in passage of air and food. It also helps absorb iron from food and helps provide instant bloating relief. Chew some fresh peppermint leaves to get relief. Or else you can follow the process below. Place a peppermint tea bag in a cup of hot water. Take out the tea bag and squeeze it to get out every bit of the healing solution. Drink the tea slowly and relax. Alternatively, you can add handful of fresh mint leaves instead of a tea bag. Or add 2 drops of peppermint oil into a cup of cool water and drink it. Chamomile relaxes the digestive system, and it contains anti-inflammatory and antispasmodic properties which relieve gas and bloating as well as heartburn, menstrual cramps, and joint pain. Drink this homemade tea for bloating and get instant relief. Add chamomile tea bag into a cup of hot water. Squeeze out the bag to get out all the goodness from it. Add honey and lemon as per your taste. Consume the chamomile tea and relax. Repeat the process 2 – 3 times in a day between the meals. Alternatively, you can use chamomile flowers instead of chamomile tea bag. Note: Don’t add milk while preparing the tea as it can trigger gas. Apple cider vinegar is a perfect cleanser, eliminator and the best food for treating indigestion. 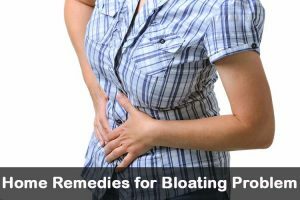 Therefore, it works as a great home remedy for bloated stomach. It can give almost instant relief from gas and indigestion. To a glass of warm water (filtered), add 1 tablespoon of apple cider vinegar (unfiltered that still contains mother in it). Repeat the process 2 – 3 times in a day on an empty stomach. If you cannot withstand the taste of apple cider vinegar, you can take acv tablets or capsules. Apple cider vinegar is completely safe during pregnancy and breast feeding. The anti-spasmodic properties of anise seeds are helpful in soothing the digestive tract. The carminative properties of it help to push out the gas build up and reduce bloating. Anise tea is the best method to get all the benefits of this herb. Chew a teaspoon of anise seeds thoroughly. Add anise seeds in your daily cooking. Combine anise seeds and celery seeds in 1:2 ratios. Add some sugar for taste. Take 1/2 teaspoon of this mixture regularly. Add 1 teaspoon of anise seeds to one cup of boiling water. Cover and let it steep for 15 minutes. Strain and drink the anise tea before or after meals. It provides quick relief from gas. As per The U.S food & Drug Administration, infants should not be given anise tea as it can lead to vomiting, seizures, rapid eye movement and restlessness. Pregnant women should avoid taking anise. Some people are allergic to anise seeds, so it is better to consult a doctor before taking them in any form. Lemon is rich in vitamin B and C, riboflavin, calcium, phosphorus, magnesium, and proteins which help in digestion. The acidic nature of lemon stimulates the production of hydrochloric acid, which helps the body break down food more efficiently. The mixture detoxifies the body as the liver enzymes work effectively due to lemon. Add 2 tablespoons of lemon juice to a cup of hot water. Stir it well and drink this on empty stomach in the morning. Drink regularly to get rid of bloating. Spicy foods and foods high in fiber and fat take longer time to digest. When the food doesn’t get break down in small intestine, it enters the large intestine where the natural bacteria in the large intestine break them down. During this process, gas is produced leading to bloating. The vitamin A in pumpkin prevents all that by promoting proper digestion. Take a cup of pumpkin and eat it regularly by baking or streaming or broiling or find a pumpkin recipe you like and eat it regularly. Activated charcoal is oxidized with hot steam or air to make it porous which states that the air and water can pass through it. The spaces in it can trap the excess gas formed by bacteria in the intestines. You can take activated charcoal in tablet, capsule or powder form. It should be taken before meals to prevent gas and bloating problems. For exact dosage as per your medical history, seek medical advice from doctor. Pregnant women and people taking contraceptives or other medicines should avoid consumption of activated charcoal. This process should not be followed for a longer period of time. To a cup of boiling water, add 1 teaspoon of dried dandelion leaves. Add lemon and honey as per taste. Repeat regularly to prevent or treat bloating. Coriander helps in treating indigestion, settling the stomach and burning sensation of gas. Add some roasted coriander seeds to a cup of butter milk and drink it. You can add 1 teaspoon of dried coriander leaves to a cup of boiling water. Cover and let it steep for few minutes. Strain and drink this tea to get relief from gas quickly. If you are experiencing excessive gas problem, then increase the quantity to 1 glass instead of a cup. Warm a cup of whey or soy milk and remove from the flame. Add 1 teaspoon each of cinnamon and honey into it. Leave it aside for 5 minutes. Reheat the mixture and slowly drink it. Note: Pregnant women should not consume more than 1/2 teaspoon per day. Breast feeding women can take one or more teaspoons of cinnamon powder. To a cup of milk, add 1/2 teaspoon of cinnamon powder. Stir well and drink it. You can add honey for taste. Add 1 teaspoon of cinnamon powder into 2 cups of hot water. Let it steep for few minutes. Strain and drink it. The combination of lemon juice and baking soda form carbon dioxide which is known for natural digestive aiding. This provides relief from gas and bloating completely in 20 minutes. Fill half of a glass with filtered water. Add 20ml of lemon juice and 1 teaspoon of baking soda into it. After the fizz comes down, fill the remaining empty glass with water. For more effective results, you can add apple cider vinegar into it to lessen the gas and digestion problems. Apple cider vinegar balances the body’s pH levels and improves overall health. Note: To alleviate stomach gas, add some baking soda to a glass of water and drink it daily before breakfast. Add some garlic into a cup of water. Add some black pepper and cumin seeds into it. Strain and let it cool down to room temperature. Consume it for few times in a day. Note: Drink this soup everyday to avoid gas and bloating problems. The combination of buttermilk, carom seeds and sea salt provides relief from gas and bloating. Here is the process of making this herbal solution. Blend one tablespoon of carom seeds and sea salt. Add this mixture to a glass of buttermilk. Drink this solution daily 2 times to get quick relief. Note: If you don’t have carom seeds, use celery seeds instead. Asafoetida is an effective remedy for stomach gas and indigestion. With this process, you can observe the results very quickly. Mix asafoetida with some water to make a paste. Spread it on the stomach and leave it on for 10 -15 minutes. The antioxidant, antiseptic and digestive qualities of bay leaves are helpful in treating stomach gas and bloating. It is also known to have anti-cancer properties. Add a bay leaf to a cup of water and let it boil for 5 – 10 minutes. Remove from the flame and let it steep until it cools down a bit. Strain and drink it in a go. Sit upright and let the gas expel. Don’t lie down for an hour after drinking bay leaf as tea. Black salt provides relief from the heaviness caused due to bloating. It can be consumed to treat bloating caused after eating. It helps in proper digestion. Combine 1 teaspoon each of black salt, asafoetida, dry ginger and cardamom powder. Consume 1/2 teaspoon of this mixture for relief from bloating. Combine 1 teaspoon each of lemon juice and black salt in a glass of water. Drink this mixture 2 – 3 times daily to get relief from bloating. If you have bloating along with nausea then use clove oil. It contains antiseptic and antibacterial properties which soothe the digestive tract. Add few drops of clove oil into a cup of water. Drink this mixture daily to get relief from bloating. Add some cloves to boiling water. Cover and let it steep for 5 – 10 minutes. Strain and drink it daily. Note: If you don’t have clove oil, use eucalyptus oil instead of it. Mint tea is helpful in treating bloating and indigestion. The soothing and cooling properties help in treating gas. Add 1 teaspoon of dried mint leaves and 4 – 5 leaves in a cup of boiling water. Let it cool down. Strain and drink it. Consume 2 – 3 cups of mint tea daily. You can also add honey as per your taste. Take 4 – 5 drops of bergamot oil on your palm and massage it gently on your tummy. This will help you relief from the abdominal discomfort. Bring 1 cup of water to boil. Add 1 teaspoon of dried leaves of black tea into it. Let it steep for 4 – 5 minutes. Now, add 1 – 2 drops of bergamot oil and let it steep for another 2 – 3 minutes. Now add honey and consume it. Triphala is helpful in treating any problems related to digestive tract system. To 1/2 cup of warm water, add 1 teaspoon of honey and 1/2 teaspoon of triphala. Stir well and consume it before going to bed. Turmeric can cure most of the problems related to digestive system. It also helps to releasing the trapped gas. You can add it to dishes. Alternatively, you can follow the below process. To a glass of warm water, add 1 tablespoon of turmeric powder. Let it steep for 2 – 3 minutes. To a blender, add 1/2 cup ice cubes, 1 tablespoon maple syrup or honey, 1 cup each of pineapple pieces and strawberries, 1/2 cup chamomile tea or dandelion root and 1/2 cup vanilla yogurt with active cultures. Blend the ingredients, pour into a glass and consume it. If you are suffering from pre-menstrual bloating then drink herbal infusion to get relief. To hot water, add 1 teaspoon each of yellow dock, burdock, dandelion root (or leaf), lemon balm and chamomile. Strain and store the liquid in an airtight container. Once it cools down, add turbinado sugar or honey into it. Consume 1 – 3 cups of herbal infusion daily at least 2 weeks prior to menstruation. If you are using fresh herbs instead of dried ones, triple the amount of herbs. Never boil the herbs. Remove the water from stove, before adding the herbs. Avoid adding sugar into this herbal infusion as it can increase the PMS symptoms. Betel leaf improves the digestion by encouraging the production of digestive juices. It also helps in removing the intestinal gases. Place a clove in the betel leaf and fold it. Chew slowly to extract the juices and swallow it. Repeat the process after each meal. If you don’t have a clove, then you can just eat betel leaf alone. Crush the dill seeds and store them in an airtight container. Add 1 teaspoon of crushed dill seeds into a cup of water. Brew this mixture for few minutes. Slowly sip the solution to get relief from the trapped gas. Pregnant women should avoid consumption of dill seeds as it can lead to uterine contractions and miscarriages. If you are allergic to dill seeds then consult a doctor before trying this remedy. Lie flat on your back and use your fingers to massage your stomach in circular (Clockwise) motions. Massage for 15 minutes or until the bloating subsides. Note: you can do this standing up, but don’t do it in a sitting position as this traps gas in the digestive system. It is very important to monitor you food intake to prevent gas and bloating problems. Foods rich in magnesium reduce fluid retention. Eat plenty of leafy greens and nuts. Potassium helps regulate the body’s fluid levels. Eat plenty of bananas, mangoes, mushrooms, and tomatoes. Probiotics keep your digestive system healthy. Regularly eating foods like yogurt, kefir, kimchi, or sauerkraut will ensure that you get plenty of them in your diet. They help to maintain your bowel movements properly. Bowels help to get rid of waste quickly which presents the build up of smelling gas and stools. Yellow mustard also helps in treating gas problem. Buy yellow mustard that contains turmeric for effective results. Refrigerate it for storage. Take a teaspoon of it whenever you suffer from gas. Cardamom is also helpful for treating gas. Chew some cardamom seeds or add them to ginger tea and consume. Parsley, whether dried or minced, contributes in elimination of the intestinal gas which, otherwise, causes bloating. The bark of slippery elm is, said to be, good for stomach related ailments. Tea of slippery elm also works as a defense against bloating. If the stomach of your little one is upset due to bloating, gripe water is the best natural cure. Since it is made up of chamomile, ginger and fennel, it gives instant respite. Foods that produce minimal gas and safe to eat are citrus fruits, grapes, rice, eggs, meat and non-carbonated drinks. Chewing some basil or adding it to cooking also helps in preventing flatulence. Black pepper and cayenne pepper help to provide relief from bloating and abdominal cramps. You can black pepper or cayenne pepper into herbal teas or sprinkle on your food. You can also cayenne pepper to lemon juice and drink it for relief. A mixture of marshmallow and pepsin also helps in easing the digestion problems which include flatulence, bloating, intestinal inflammation and stomach pain. It also aids the digestion and helps to regulate the digestion. Avoid fast food, processed foods, foods that contain too much fibre and other foods that are fatty, spicy, sugary, fried, or salty. Peaches, prunes, oats, broccoli, Brussels sprouts, apples, lentils, cabbage, corn, cheese, kidney beans, soy beans, onions, pears, lettuce, and whole grains cause bloating and gas. Try to avoid them. Avoid dairy products especially if you are intolerant to milk and milk products. Even though you are intolerant, sometimes milk can cause gas build up and bloating. Avoid caffeinated foods and unsavoury edibles. Drink plenty of water to flush out toxins and impurities that cause bloating. Concentrate more on drinking between the meals than during the meals. Taking breathe provides instant relief from bloating. When you are anxious or stresses, increased breathing rate makes us to swallow air. So taking deep breathe will reduce the gas in few minutes. Whenever you are bloated, take 5 – 10 deep breaths and wait for 10 minutes. You may see the result. Exercising helps to keep the digestive tracts mobility and expels the gas build up. While exercising make sure to breathe through nose and avoid breathing through mouth. The Upside Down Bike exercise helps to expel the gas quickly. Lie down on your back, use your hands to support yourself up with your legs in the air. Now move your legs in the bicycle motion. Hold onto that position for 5 – 10 minutes and relax. This should expel out the built-up gas. Eat slowly and chew thoroughly to avoid swallowing air. Reduce stress through physical activities like yoga. Avoid salt as it encourages water retention. Eat fewer carbohydrates and starches. These also promote water retention. Don’t use straws or chew gum. Both of these lead to the consumption of air. While uncomfortable, bloating is generally harmless. However, if your condition is chronic, consult with your doctor. Chew your food thoroughly as it helps in digesting it faster and it will pass through the intestines with ease. This helps in preventing gas build up. Instead of eating 3 large meals, eat 6 small meals daily. Try taking stairs instead of elevators. If you are feeling cosy near your waist band after meals, then take a walk for 10 minutes. It helps the air to pass through the digestive tract. After supper, avoid sleeping immediately as it can leads to gas in chest and bloating. Take a walk for some time before sleeping. Have you tried any of these home remedies to cure bloating? Do you know any bloating problem solution we haven’t mentioned? Share your experience with us! Try any method mentioned above in the article as per your convenience. Apart from that avoid carbonated beverages, eat smaller meals more frequently throughout the day, reduce stress and avoid smoking. how can cure lower abdominal and lower back pain through the home therepy. send me the simple tips. It is recommended to consult a doctor to find out the exact reason for the pain in lower abdominal and lower back. Once you know the exact reason, we will be able to tell you how you can cure it with natural remedies. This is a very informative and helpful article. Thankyou. I moved to Canada 7months back from India, from 2months i am suffering from bloating. I used to go for work in india, but here i dont work amd hence dont have any kind of physical activity. Few days back my condition was worst, I used to get sever pain in abdomin , especially on the left side n few times on right. I consulted doctor here they did blood , urine test and said everything is normal.But the pain i was geting was unbearable along with that had bloating all the time. Doctor got my abdominal ultrasound,even there everything was fine.But my pain and bloating didnt stop. I consulted doctor in India, he suggested me to take anti pasmodic medicine Ganaton Total. Now the pain has reduced,but bloating still continues. I am a vegetarian, I dont consume meat or egg.There is no change in food habit. I am not able to make out if I am allergic to something,even if i dont drink milk or consume sugar then also i get bloating. I have now started running on tredmill . Should I go back to India, or should i get checked for any sort of allergy.Should I do more excercise .I am worried that after stopping this medicine ,pain will come back. Drink ginger, fennel or caraway seeds tea in the morning on empty stomach and before meals. We have mentioned a massage and diet plan in our article. Kindly follow it for few days and check if you see any improvement. Try to find out which foods are causing you bloating and avoid them. Don’t speak while eating food and don’t use a straw for drinking. Avoid carbonated drinks and eat small meals throughout the day instead of large meals. We have mentioned few exercises in the tips section, try them whenever you feel bloated. Apart from that increase your physical activity. Drink plenty of water. Instead of eating large meals 3 times a day, eat smaller meals 6 times in a day. Reduce acidic foods and fiber content in your food. Drink plenty of water to stay hydrated. Do some physical exercises to promote digestion and overall health. Thank you. I found the article very informative. I drink up to one litre of betel leaf juice with lemon juice everyday through the day. It helped a lot and brought down the bloating and constipation. I feel very comfortable with it. I also avoid heavy food like using oil and spices. Balancing a diet with a filling breakfast, light lunch and okayish dinner preferably eaten 2 to 3 hours before going to bed. Plenty of exercise is a must. One must be relaxed and not stress out about the stomach problems. Thanks for your suggestions and sharing your experience. I eat small children and find it keeps the bloat away.